-- Select a Size/Color -- Small Bottle - Out of Stock! For cats who need the weed, this Meowi-Waui Leaf and Flake Meowijuana® Catnip is a like a vacation in a bottle! The most legendary name among bud connoisseurs now has a version for cats! 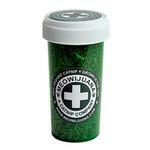 Our Meowi Waui catnip is a trippy blend of leaf and flake from only the most heady fragrant catnip blossoms, making this a simple yet potent treat for your furry friend!